I’ve been meaning to write up this recipe for ages. I have fallen out of the habit of writing up the recipes for the blog, adding them to my Instagram posts instead. Little one has dropped a nap during the day which is when I used to write up recipes but I’m going to try to write up a recipe once a week again. Since my last blog post we have moved house but before we did little one and I helped to run a Bumps, Baby and Toddler group, for our local NCT branch. We had been going most Mondays since she was 7 months and running it for the past few months. It was a great way to make new friends and little one loved running around, playing with the other babies and toddlers. It meant we also got to pop by the fruit and veg stall in town afterwards and pick up some fresh goodies for the week. 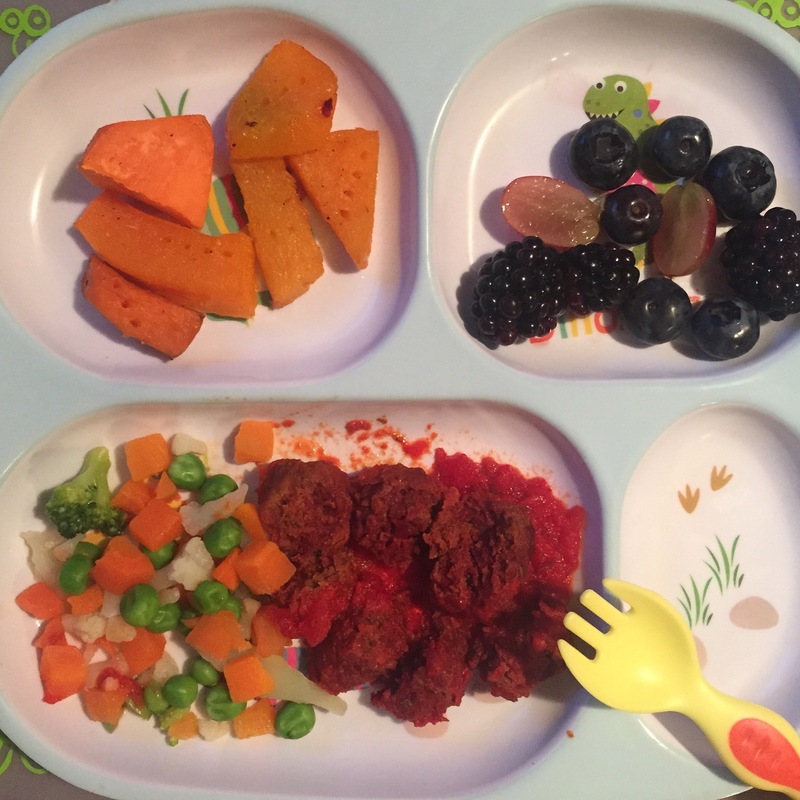 I tried to get something different each week for little one to try. One of the more successful discoveries was beetroot! It was delicious roasted with other root vegetables but the hit was beetroot and beef meatballs. I prepared them a little earlier in the day so that they had time to chill in the fridge before cooking. As well as chilling them, I found mixing them in the food processor helped them to keep their shape when cooking. A little word of warning: raw beetroot has a knack of staining things so be careful when handling and preparing them. I baked the meatballs in a tomato sauce to keep them a little healthier and moist. You could also use the mixture to make burgers or sausage shapes. I served them with roasted butternut squash and sweet potato, but they would be equally as great with pasta. Tomato sauce, you can find my recipe here. 1. Add all the ingredients for the meatballs into a food processor and whizz until combined but not completely smooth. 2. Using your hands roll the mixture into balls, smaller than a table tennis ball. It should make 15 roughly. Place on a plate and pop into the fridge for an hour to chill and firm up. 3. Preheat your oven to Gas Mark 6, 200 C. Remove the meatballs from the fridge and heat a splash of oil, in a pan over a medium to high heat. Brown the meatballs in the pan and remove, placing into an oven proof dish with the tomato sauce. 4. Pop into the oven uncovered for 30 minutes. Check the meatballs are piping hot before serving.